The firm said that so far 30 people had applied for the positions - some of them in Glaswegian. 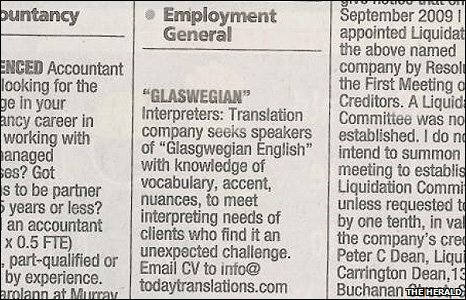 Today Translations spokesman Mick Thorburn said: "Over the last few months we've had clients asking us for Glaswegian translators. "After some consideration we've decided this is a service we would like to offer. "Usually, the role would involve translating documents but in this case it's more likely to be assisting foreign visitors to the city whose 'business English' is not good enough to understand the local dialect." Mr Thorburn said successful candidates may have to sit in on business meetings. Today Translations said that depending on the volume of applications, it expected to contact the successful clients in the next few weeks. Earlier this year a bus driver was recognised for teaching his Eastern European colleagues at First Glasgow bus company to understand Glaswegian slang. James Lillis said: "When new employees come to Scotland and hear the Glasgow accent, it can be a problem. Drivers have to learn to understand what is meant when a customer says, for example, 'Gie us an aw day tae the toon' (Give me an all day ticket to the town)."